New Arab Media (NA3AM); an award-winning transmedia incubator producing and distributing Arab inspired content with global appeal; is proud to announce its support for the Jordan Youth Cup 2016 championship tournament. With a mission to unlock Arab creativity through social innovation, creative training academies and live events engaging Arab youth; New Arab Media (NA3AM) shares His Highness Prince Ali Bin Al-Hussein’s vision for the Jordan Football Association and the Jordan Youth Cup Initiative for promising athletes under 12 years old. The Jordan Youth Cup Championship is an event organized by Al Ahliyah (CMS) and Bishop Schools with the participation of His Highness Prince Ali Female Grassroots Centre and solely sponsored by New Arab Media (NA3AM). The championship was created for the generation of junior women with the potential to be outstanding athletes, especially in women’s soccer. 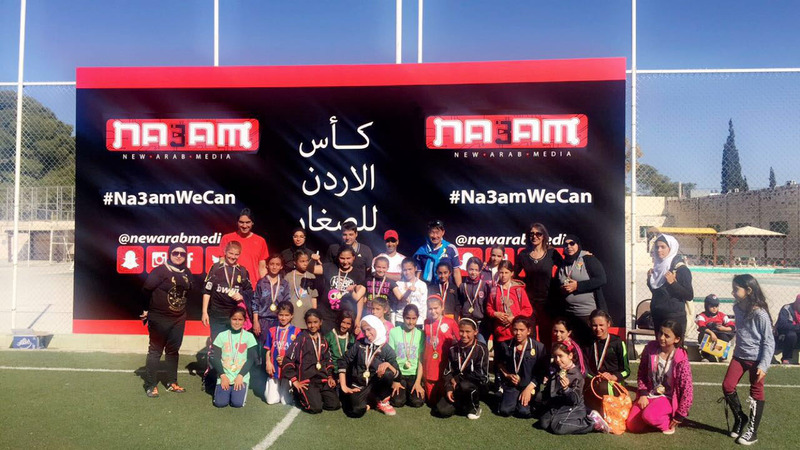 The tournament is catered to female athletes from all over the kingdom; coinciding with NA3AM’s objective of empowering women, as well as working towards bridging the gap between the private and public sector. The tournament took place on the 1st and 2nd of April and ended on Saturday the 9th of April with a closing ceremony under the patronages of HE Senator Haifa Najjar, Director General of Al Ahliyah and Bishop School, special guests and representatives of the New Arab Media (NA3AM), the sponsoring company. The championship included girls under 12 years of age from all governorates of the Kingdom and will take place in Bishop School soccer field wherein 16 teams will play for the title. Participating in the league are girls from; Irbid, Ramtha, Jerash, Ajloun, Zarqa, Salt, Sukainah Amman, Sahab, Madaba, Karak, Sheikh Hussein (Jordan Valley), Aqaba and Quaismeh Amman districts. A total of 25 participants from each district will be joining the tournament. New Arab Media (NA3AM) is honored to be a part of this tournament; supporting aspiring talents is something that NA3AM is dedicated to, give our unique position in the region and the industry. As part of New Arab Media’s goal to unlock Arab creativity, NA3AM has sponsored 25 year old Mohammed al Khatib, a Palestinian short-distance track runner, whose goal is to compete in the Olympics. We sat down with Mohammed and asked him a few questions about his goals and aspirations, as well as his training routine and diet. Check it out below.